Publishing Information London: Cassell and Company,1925. Description 1st Edition. xii, 308pp, photographic frontispiece. Foreword by Rt. Hon. Viscount Inchcape. Original variant issue binding black lettered tan cloth with frontispiece portrait. 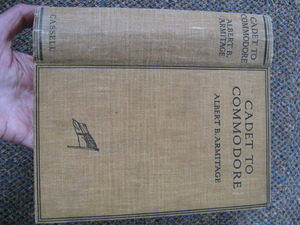 Biography of Captain Albert B. Armitage, Commodore of the Peninsular and Oriental Steam Navigation Company with two chapters on the Discovery Expedition. Shelfware. Some scattered light foxing, gift inscription to fep,some minor spotting, mainly to page edges. Contents clean. A nice copy of this hard to find title.